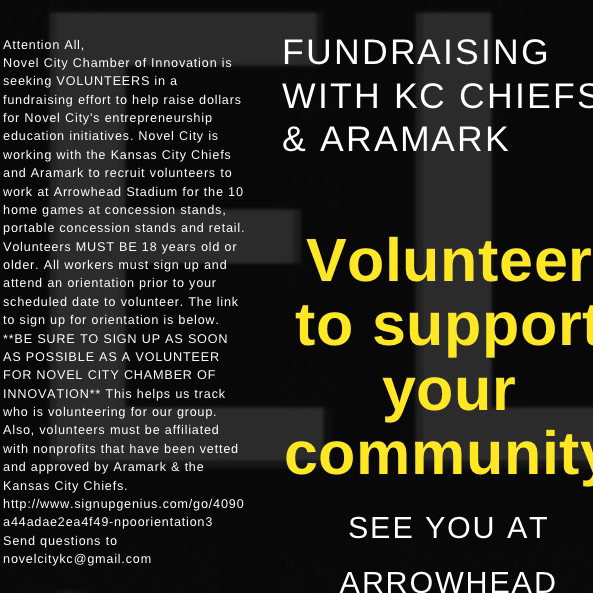 Novel City Chamber Of Innovation is working with the Kansas City Chiefs and Aramark to recruit workers for this seasons' home games. Novel City volunteers work (Concession stands, Portable Concession Stands, Retail) This opportunity is open to 18 years old and up. All workers must sign up and attend an orientation prior to starting. The link to orientation sign up is below. **BE SURE TO SIGN UP AS A VOLUNTEER FOR NOVEL CITY CHAMBER OF INNOVATION** Workers must be affiliated with nonprofits that have been vetted and approved by Aramark & KC Chiefs. Click below to sign up. Novel City Chamber Of Innovation is working with the Kansas City Chiefs and Aramark to recruit workers for this seasons' home games. Job types (Concession stands, Portable Concession Stands, Retail) This opportunity is open to 18 years old and up. All workers must sign up and attend an orientation prior to starting. The link to orientation sign up is below. **BE SURE TO SIGN UP AS A VOLUNTEER FOR NOVEL CITY CHAMBER OF INNOVATION** Workers must be affiliated with nonprofits that have been vetted and approved by Aramark & KC Chiefs. Click below to sign up. Log in to see who is volunteering for Volunteer to work at Arrowhead Stadium for all KC Chiefs home games!